Florentine-born Stefano della Bella was a prolific draftsman and etcher who succeeded Jacques Callot at the Medici grand-ducal court as a professional designer-printmaker. The roots of his graphic style lie in the calligraphic Mannerism of Callot, but during the course of his career Della Bella developed into an exuberant Baroque artist. His work remained influential for many decades and has been actively collected up to the present day. Della Bella was born into an artistic family; his father was a sculptor, and his three brothers all became artists. Della Bella himself was apprenticed to a goldsmith but also studied drawing, painting, and etching. He became a protégé of the powerful Medici family and in 1633 was sent to Rome, where he lived in the Medici palace. There he developed his skills, making original drawings of public festivities, architecture, landscapes, and antique sculpture. 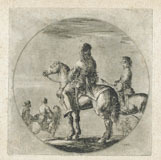 In 1639 Della Bella was sent to Paris in the retinue of the Medici ambassador to the court of Louis XIII. There he remained until 1650, executing print commissions for Parisian publishers and for prominent patrons such as the Cardinals Richelieu and Mazarin. In 1650 Della Bella returned to Florence.